Pretec maintains its slogan “Small Size, Big Impact,” as a new, ultra compact USB 3.0 flash drive in a violet metal chassis comes along, and promises to provide even higher quality data transfers at exceptional speeds. Back in January at CES 2011, Pretec, a leading manufacturer of popular memory devices, introduced the i-Disk Rex 100, a USB flash drive that boasts a SuperSpeed USB interface and a massive 128GB storage capacity that can write up to 200 MB/s and can read at up to 175 MB/s. Showcasing a tiny physique of 74mm x18mm x7mm and weighing a mere 8.5 grams in a slim environmentally friendly paper package, the new Pretec USB 3.0 flash drive is the smallest drive of its kind, while simultaneously providing the largest capacity USB 3.0 flash drive in the world! With its portability and storage capacity, this USB drive may take away a little bit of the limelight from recently introduced Verbatim’s USB 3.0 External SSD and LaCie’s FastKey. The drive’s minute size is 40% smaller than LaCie’s comparably priced USB. Supported by a USB 3.0 interface, users are assured of speed that’s approximately ten times faster than a USB 2.0 flash drive. It guarantees higher level performance with a transfer rate of 5Gb/s and an unparalleled read speed of 200MB/s and write speed of 175 MB/s. As crazy as it seems, it takes merely 30 seconds to download two hours of a high definition movie! 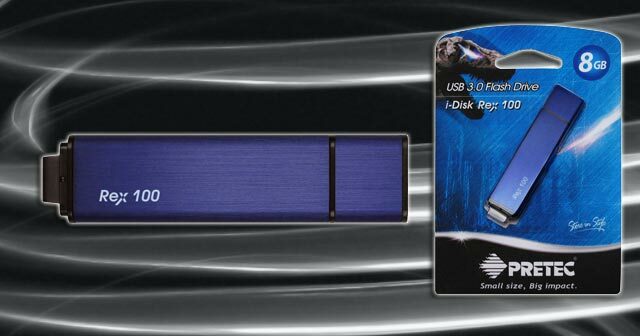 The i-Disk Rex 100 also appears to be available in 8 GB, 16GB, 32GB and 64GB capacities. The drive is compatible with ME/2000/XP/Vista, Windows 7; Mac 10; Linux 4 and other higher OS’s. The only disadvantage to this device may be what will draw you to it in the first place: its size. You may want to place it on a lanyard or key ring to prevent loss. The i-Disk Rex 100 is currently posted on the company’s site, however price and purchasing information has yet to be divulged. Since the flash drive has superior speed coupled with small size, expect it to be at a higher price point. Are you excited about this new USB flash drive? Do you think a smaller size has an advantage over larger flash drives? Tell us what you think! This entry was posted in Articles, Cool Drives, Flash Drive, Pretec, SuperSpeed USB 3.0, USB 3.0, USB 3.0 Flash Drives, USB Flash Drives, USB Stick, USB Storage Drives and tagged compact USB 3.0 flash drive, i-Disk Rex 100, Pretec, Pretec i-Disk Rex 100, Pretec SuperSpeed SUB 3.0, Pretec USB 3.0 Flash Drive, SuperSpeed USB 3.0, SuperSpeed USB 3.0 Flash Drives, tiny USB 3.0 flash drive. Bookmark the permalink.